Trout Fishing, Tubing, Kayaking, Relaxing, Aska Adventure, and Relaxation all in one. This magnificent cabin is located directly on the Toccoa River - step out on the back porch and cast a line for a little bit of fishing or unwind in the hot tub that directly overlooks the beautiful river. You can even put in the river upstream and float in a tube or canoe back to the cabin. "Rivers "D" Lite" is a pet friendly waterfront cabin on the Toccoa River in the heart of the Aska Adventure Area. Trout fishing, tubing, kayaking, mountain biking, and hiking are all out your front door--or just stay home and relax! The cabin has 3 bedrooms and 2 baths and sits right on the waters edge. Seating available for river watching in the shade or cooking hot dogs or marshmallows around the fire pit. One of the many "put ins" is at Sandy Bottoms which is only about 10 minutes away by car and will give you a fun 2 hour float trip. Easy to repeat several times in a fun day at the "Rivers "D" Lite" river. Or you could just enjoy the hot tub, and rocking chairs on the porch while you cook your supper on the gas grill. You can leave from the cabin and get on the Benton MacKaye hiking trail within about 5 minutes as it crosses the Toccoa river at the historic Shallowford iron framed bridge that was built in 1918. There is seemingly endless miles of good pavement for motorcycle and bicycle riding to some of the best mountain biking trails "Aska Adventure Area" in the southeastern United States. Inside the cabin you can enjoy the 46" flat screen TV with Dish Network and DVD player mounted on the floor to ceiling rock mantle above the gas fireplace, cook a fresh trout dinner in the new kitchen. There are 3 bedrooms. This cozy cabin offers a prime chance for some serious relaxation and fun in Blue Ridge. The Toccoa River is known for its adventure, from kayaking for the more intense personality to a nice relaxing tube ride that would be great for the whole family, it is even fun for kids starting at age 6.. You can relax by skipping stones, trout fishing or just dipping your feet in the river. There is a fire pit out back for great family time and relaxation after dark. Roast some marshmallows, hot dogs, tell stories and just relax and let the sounds of the river and the mountain air relax you both mind and spirit. 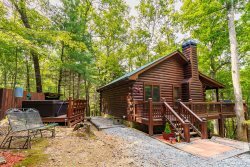 This North Georgia Mountain Rental cabin is located approximately 10 minutes from Downtown Blue Ridge, GA. The cabin is on the Toccoa River, in the Aska Adventure Area, which is very close to the Rich Mountain Wilderness Area, USFS, Benton McKaye Hiking Trail, Blue Ridge Zipline and Canopy Adventures, Toccoa Riverside Restaurant, and many North Georgia Waterfall Hiking Trails. Along the Toccoa has good privacy and is considered a rare Toccoa River waterfront Blue Ridge Cabin Rental. "Georgia" was awesome. She was great!!! Great cabin. Very clean and very nice. We loved our stay. Thank you, team members, for timely responses to emails and phone calls. Your customer service is fantastic! The folks at Georgia Mountain Cabin Rentals are very friendly and go out of their way assist you. They respond to emails and calls in a timely manner. Their customer service is fantastic. I greatly appreciate your attention to detail. We love this property. It's one of the best on the river. We've stayed at Rivers D'Lite at least three times...maybe four. I've lost count! My family tries to visit Blue Ridge once a year in the summer. Flexible and accommodating. Staff was very friendly and accommodating. We had a great experience. They were excellent! We had a great time. The customer service from the main office was exceptional! A great place to rent your next vacation cabin! What a beautiful stay we had. Everything was as we expected. We will be returning to stay again! Have been professional on EVERY contact. If there is a problem, it is corrected immediately. The lady who checked me in was so sweet! Had a good experience with anyone I spoke with while planning my stay. Perfect cabin location & the cabin itself felt very homey!! Loved the huge backporch & the fact that we could bring our dogs!! My lab had the best time in the water. I've rented from GMCR many times now, and always have a great experience. These are good, friendly folks with a solid knowledge of the area and a focus on customer service. Thats why we keep coming back! Rainy, cold and stormy most of the time....Mother Nature dealt us a curve so we found other things to enjoy besides fishing. This was my 4th time in this cabin, so it goes without saying, we LOVE the place and we'll be back! Beautiful! Very clean and well stocked with the comforts of home. All of the GMCR members that I had contact with were friendly and well as helpful. We all enjoyed our stay and plan to return to this property.